In his long career as a poet, Buddhist teacher, spiritual advisor, and writer, Stephen Levine has changed our understanding of death and dying. 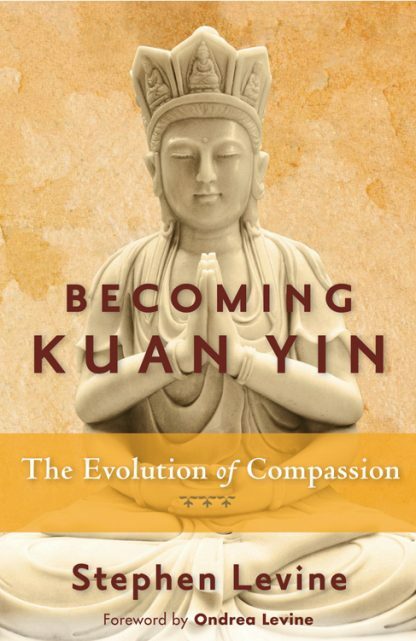 In Becoming Kuan Yin, Levine�s first new book in many years, he turns to the legend of Kuan Yin, the Bodhistitva venerated by East Asian Buddhists for her compassion. In Becoming Kuan Yin, Levine shares the tale of Miao Shan, born centuries ago to a cruel king who wanted her to marry a wealthy but uncaring man. This is the story of how Miao Shan refused to follow the path her father had in mind and, instead, became Kuan Yin, the first acknowledged female Buddha who watches over the dying and those who work with them. Levine weaves together story and practice and helps readers discover their own infinite capacity for mercy and compassion under difficult circumstances. This book will have resonance for Kuan Yin's millions of followers. From the book: "Becoming Kuan Yin follows her very difficult and remarkably beautiful path to Bodhisattva and ultimately completed Buddha nature. It is a semi-fictional tale composed of myth and the true nature of practice. She was Miao Shan, a gifted human being on an arduous merciful path, long before she came to be referenced as a celestial."